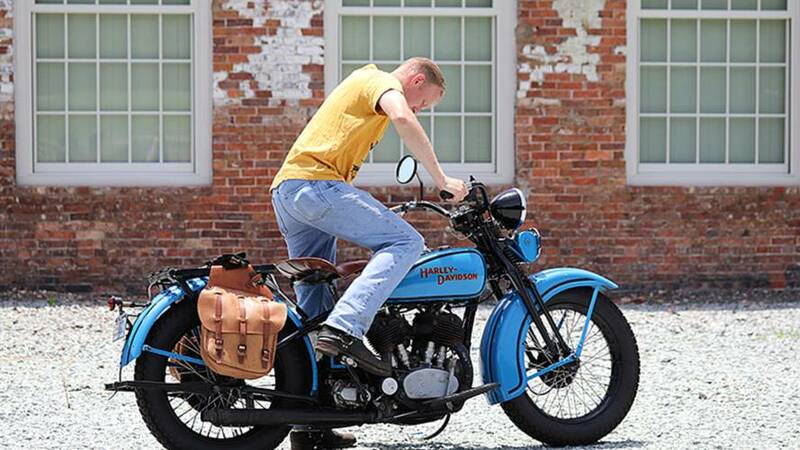 If you ride a modern motorcycle, chances are it is not equipped with a kickstarter. 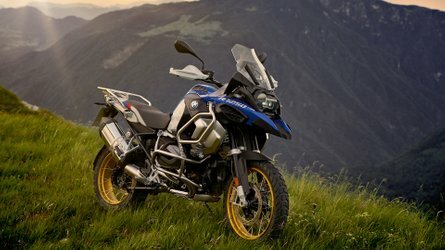 With the push of a button, your motorcycle roars to life without you needing to put in an ounce of effort. Back in my day—when we still had to walk 10 miles to school uphill in the snow (both ways)—motorcycles could only be started by frantically kicking at a small pedal and every old biker had a limp from some variety of kickstarter related injury. 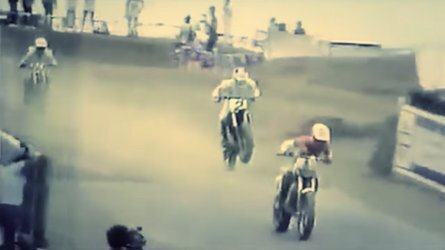 For all you young riders who are walking around without any constant knee pain, I'm going to explain to you the fundamentals of how the simple act of pushing down on a pedal can start a motorcycle. The kickstart mechanism is actually made of quite a few parts once you get past the kicker arm and into the transmission, so I am going to divide the system into two main sections. 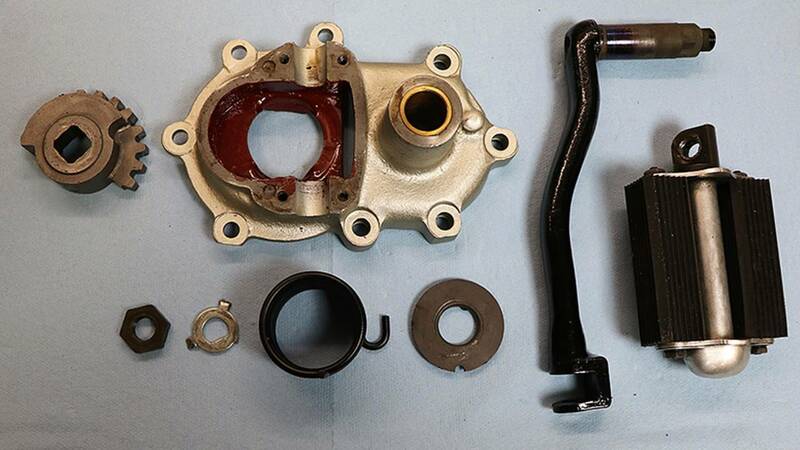 The first being the kicker arm assembly which as you would expect is made up of the kicker arm, along with a "bicycle pedal", a return spring, the starter cover, a starter sector gear and a variety of fasteners. Parts making up the kicker arm assembly. The entire point of this collection of parts is to transmit power from your leg to the transmission, and as you would expect this is fairly straight forward. The kicker pedal attaches to one end of the kicker arm and the other end passes through the starter cover where the starter sector gear is bolted to it. Now, you don't just want the kicker arm flopping around, so there is a two part system which keeps the kicker arm in the proper position. The system consists of an external spring and a cleverly designed starter sector gear which has two "hard stops" built into it. One stop keeps the kicker arm from rotating clockwise past the 12 o'clock position, the other keeps it from rotating past the 6 o'clock position. Between the two stops, the kicker arm operates in an 180 degree arc that rotates in a counter clockwise motion (toward the rear tire). Tension from the spring keeps the kicker arm in the upright position and returns it to upright after each kick. Since the starter sector gear only travels 180 degrees, it only has teeth on part of the gear. On the transmission side, all the remaining parts are mounted on the mainshaft and they include the starter clutch, the starter clutch spring, the starter mainshaft gear, and a couple necessary fasteners to hold it all in place. Basically the starter clutch spring pushes the starter mainshaft gear against the starter clutch causing the two gears to mate. 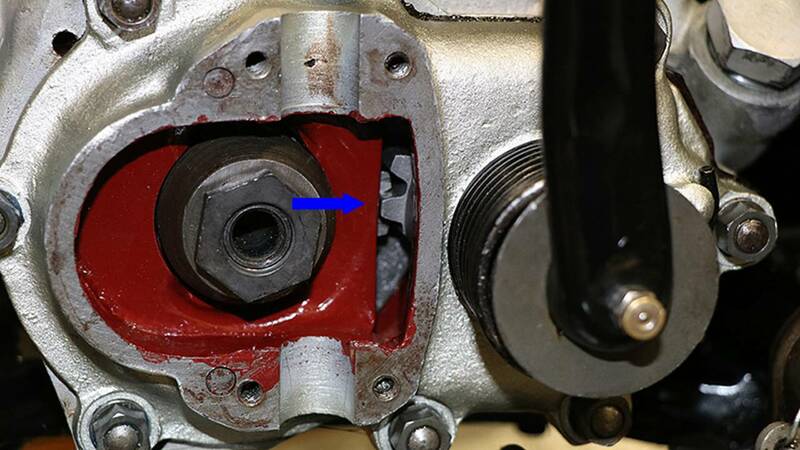 In the photo below you can see how the starter mainshaft gear (larger gear on the left) has teeth inside the gear which match up with the teeth on the starter clutch (smaller gear on right). Note that the starter clutch has two square keyways cut inside of it. These allow it to be locked to the mainshaft, so anytime the starter clutch is turned the mainshaft is turned as well. In the following photo you can see how everything looks when mounted on the mainshaft. 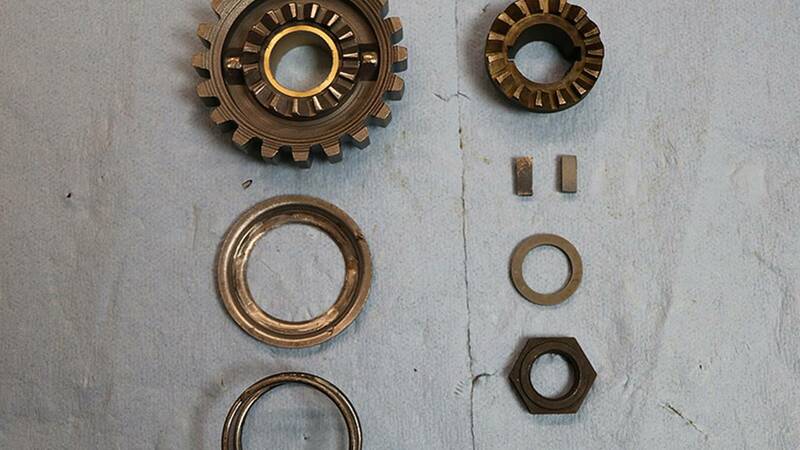 Starting at the left is a bearing which the mainshaft rides on, followed by the starter clutch spring, the starter main shaft gear, the starter clutch and finally a washer and nut to hold everything together. Starter clutch and starter main gear mounted on the transmission mainshaft. As you probably have guessed, the starter sector gear mates with the starter main shaft gear, so when you push down the kicker pedal the end result is that the main shaft turns. Seems pretty easy, but that is not quite the end of the story. 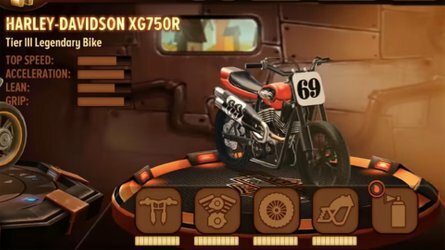 Remember that whenever the motorcycle is in gear, the main shaft is also turning. So if the starter clutch and the starter main shaft gear are mated together, the main shaft is only going to be able to rotate the 180 degrees between stops and not the full 360 degrees it needs to. Another clever piece of engineering allows the starter sector gear to disengage from the starter clutch when the kicker arm is in the 12 o'clock position. 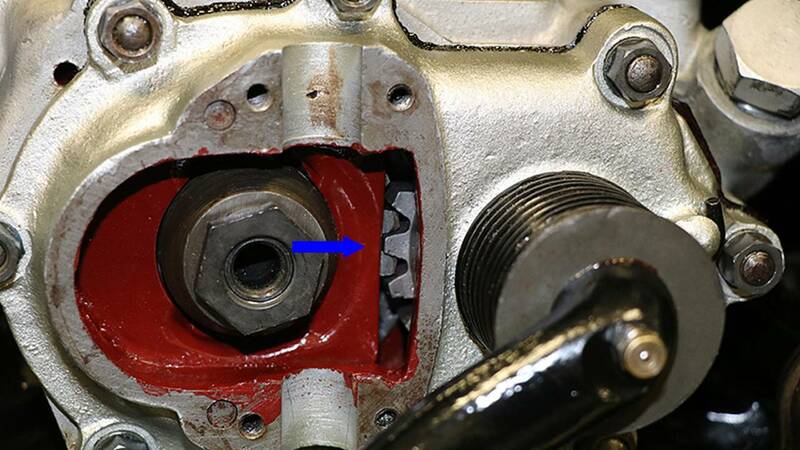 The secret are these two ramps located on the starter main shaft gear, just inside the outer row of teeth. Close up of the starter main shaft gear. These two ramps line up with two much larger ramps that are located on the inside of the starter cover on a piece which is called the release cam disc. Close up of the inside of the starter cover. 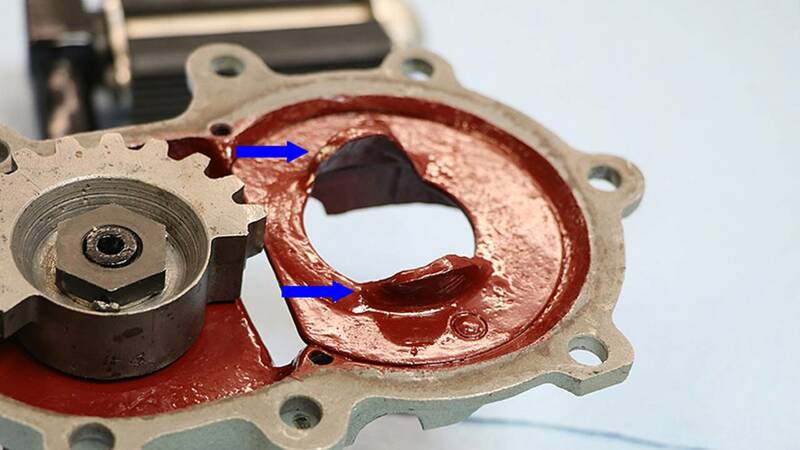 When all the ramps are lined up, the result is that the starter main shaft gear is pushed down the main shaft which disengages it from the starter clutch. 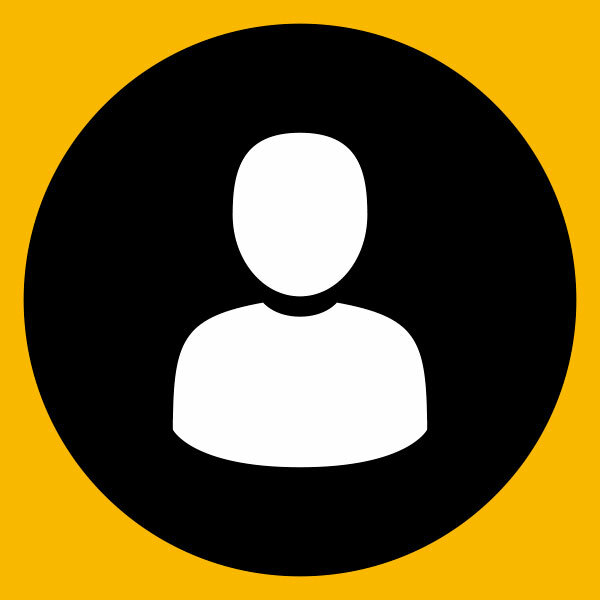 This allows the main shaft to spin freely during normal operation. 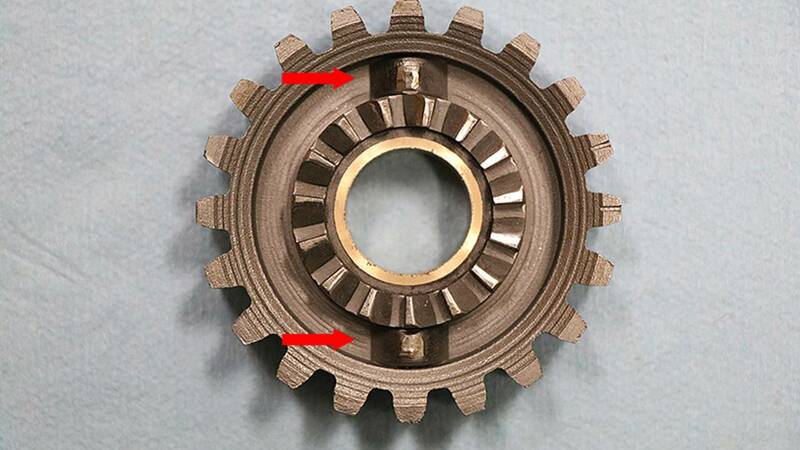 Of course proper alignment of the gears is critical, so the engineers marked two of the outer teeth on the starter main shaft gear with straight lines. 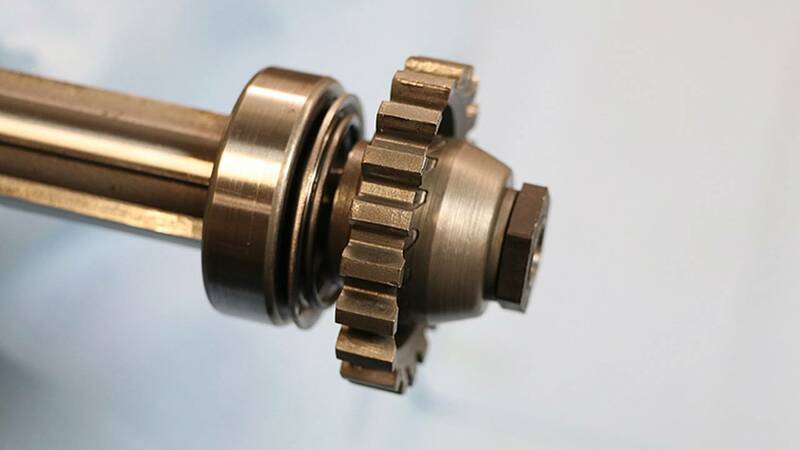 When assembling the transmission, the first tooth on the starter sector gear must be in between these to gears. If you look carefully you can also see in the next photo how the ramps have pushed the starter main shaft gear back towards the transmission. Assembled kickstarter with the pedal in the upright position. If we rotate the kicker pedal counter clockwise, the starter main shaft gear's ramps no longer align with the ramps on the release cam disc. The result is that the starter clutch spring is able to push the starter main shaft gear forward so that it mates with the starter clutch. 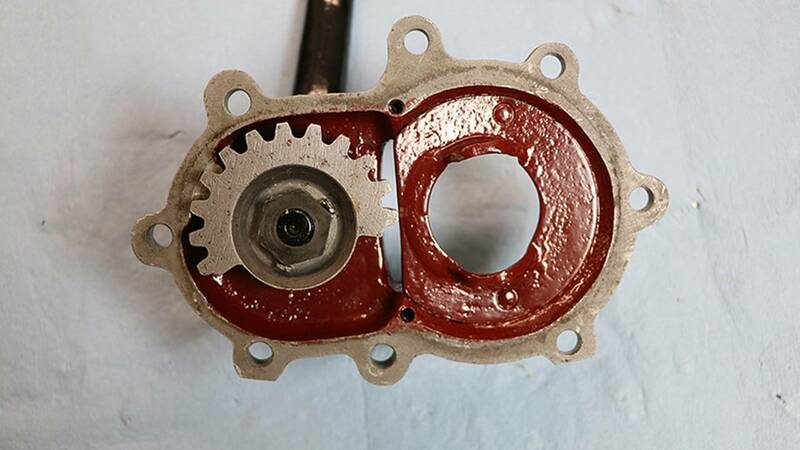 You can see in the photo below that the starter main shaft gear has moved away from the transmission and its teeth are more engaged with the teeth on the starter sector gear. Kickstarter in the down position. 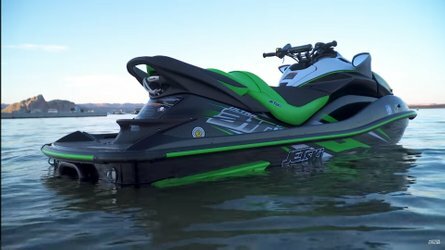 Now you can see how pushing down the kicker pedal puts in motion a chain of events that ultimately turns the transmission's main shaft. In the next article we'll look at how the clutch operates and how turning the main shaft can be used to crank up the engine.